Corpse Flower omits a "foul odor of rotting animal flesh" and only blooms for a few days every 7-10 years, according to the Conservatory. This year's flower, Suma the Titan, is a 10-year-old sibling of last year's flower Terra the Titan and it will bloom for the first time. The Conservatory of Flowers opens Tuesday through Sunday from 10 a.m. to 6:30 p.m. It's going to get stinky in San Francisco next week. The Titan Arum, better known as Corpse Flower, is predicted to bloom some time next week at the San Francisco Conservatory of Flowers in the Golden Gate Park. 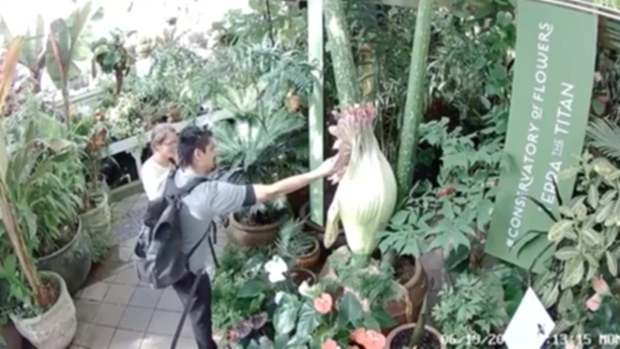 The Conservatory has already put up a livestream of the infamously pungent flower for those who aren't able to visit in person. The livestream made headlines last year after a man was caught fondling the petals, despite signs that said do not touch. The man smelled his fingers after touching the flower and even proceeded to take a photo with it. Aptly named Corpse Flower omits a "foul odor of rotting animal flesh" and only blooms for a few days every 7-10 years, according to the Conservatory. The Conservatory of Flowers opens Tuesday through Sunday from 10 a.m. to 6:30 p.m. Officials said the hours will be extended on the day Suma blooms and several days after.